In Map view, select a horizon from the Horizon drop-down menu, then select a property from the Property drop-down menu. In this example, RMS is chosen so that the relationship of the bright amplitudes to structure can be visualized. 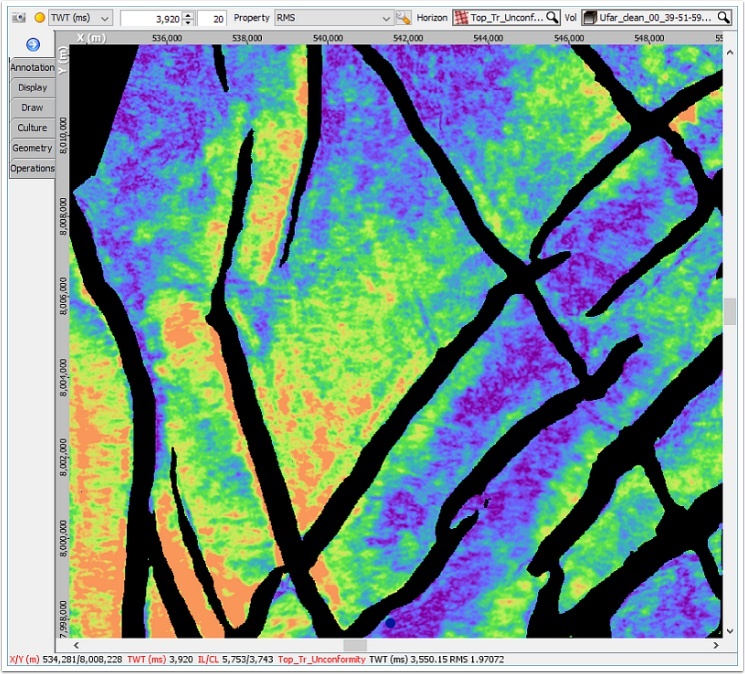 To overlay structure contours, open the Display tab and check the Show Contours box. 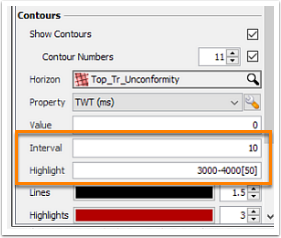 If you would like to display the value of each contour, check the Contour Numbers box and modify the text size as needed. By default the contours are set to display values taken from horizon currently shown in Map view. 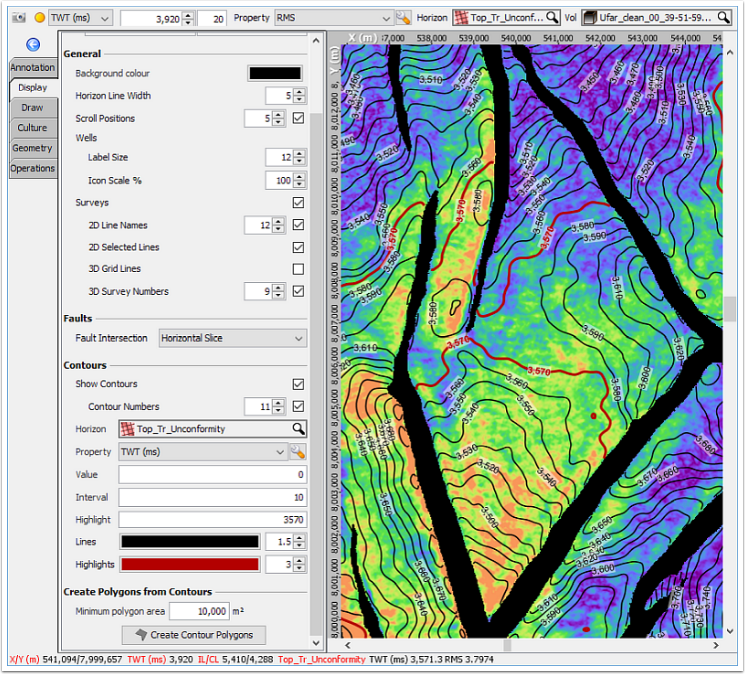 To create a horizon structure contour map overlaid on RMS amplitude, first select the horizon currently displayed in Map view from the drop-down menu. Next, select either TWT or TVDSS from the Property menu to overlay structural contours. 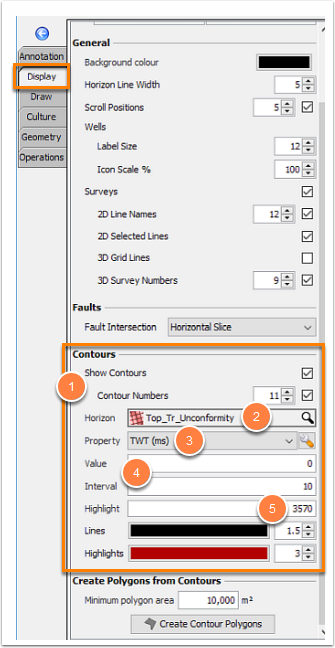 While this workflow demonstrates how to display structure contours, it’s just as easy to display contoured amplitude, isopach, or other maps by selecting a different property to contour. The Value and Interval inputs allow you to select a starting value and increment for your contours. Set the Value to 0 and the Interval to 10 to display a contour every 10 ms, starting at 0. Adding a contour value in the Highlight input is optional, but can be useful for showing the structural spill point, or highlighting a specific increment. 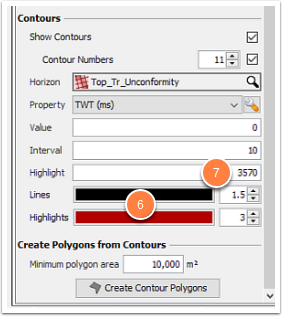 Multiple contours can be highlighted by entering values separated by a comma. To highlight contours at a specific increment, enter a range with an increment in brackets, i.e. 3000-4000 , then choose a new color for the highlighted lines and increase the line thickness. The appearance of both the contour and highlighted contour lines can be modified by selecting a color and line thickness for each category. For this example, we’ll change the color of the highlighted contour lines to dark red and make them a bit thicker than the regular contour lines so that the structural spill point seen in the fault bounded structure stands out. We’ll also change the highlighted value to the observed structural spill point, 3570 ms.